This is an broadcast email utility, not a single email send. 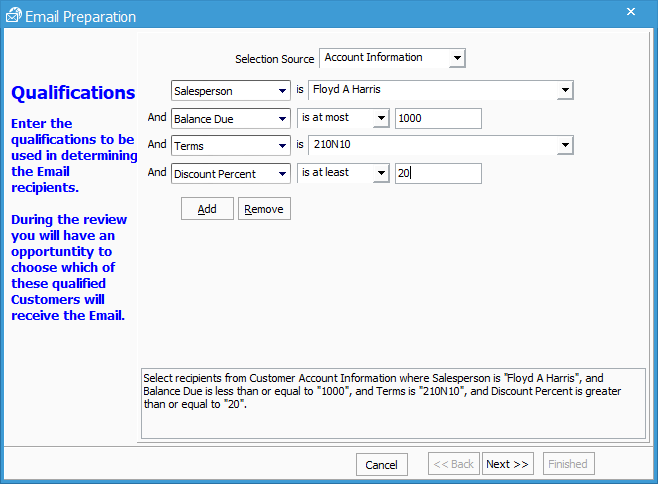 It provides a wizard to allow the selection of a group of customers that will receive a common email. The email message text may be selected from a catalog or entered manually for this email. If entered manually, the user has an option to save this for future emails. An option exists to record a note on each customer to whom an email was sent with either the subject, the subject and enter text, or some other text entered for this purpose. Open the Broadcast Email Messages (Email Preparation) wizard, select Customer > Broadcast Email Messages on the menu bar. The Qualifications window will open. Use this window to enter Qualifications (criteria) for determining the email recipients of the message to be broadcasted. If desired, narrow down the email recipients further by clicking the Add button to select a specific field based on the selection source chosen. Choose the logical operator from a drop down (is, contains, is less than, is greater than, is between) or the word “is” will appear when none exist. If a drop-down menu appears, select the appropriate logical operator that allows you to exclude and/or include specific email recipients. Depending on the previous selections, the next field will either be another drop-down menu, a field with a lookup button (i.e. if the previous selection was Customer ID), or a blank text box in order to include the appropriate email recipients. Continue to Add further fields in which to send the emails until you are satisfied. Under your previous selections the word ‘and‘ will appear and more fields that you can fill out as previously explained in steps 4 through 6. You can continue to narrow down the email recipients using the Add button, until you are satisfied. Click the Remove button, if you want to remove any of your previous selections. Click the Next button, when the desired selections have been made to determine the email recipients. The next window will open, which is called Review. Use this window to review the customers that were selected to receive the email message from the Qualifications you entered in the previous window. Click the Back button if the selected customers are not the ones you want and return to the Qualifications window to redetermine the email recipients. If you do not need to redetermine the recipients in the data grid of the customers previously selected, use the ‘?’ field to check the checkbox next to their name to include them in the email broadcast. If not, uncheck the checkbox. 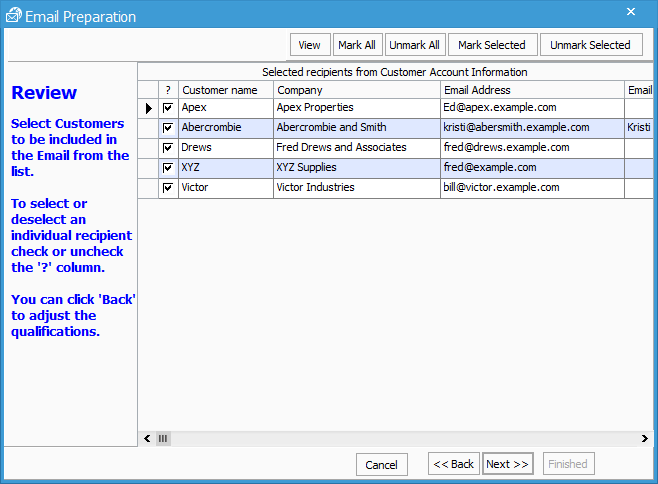 To automatically check and uncheck the above described checkboxes you can also use the four buttons near the top: Mark All, Unmark All, Mark Selected, and Unmark Selected. Click the View button, near the top to view the ACCTivate! window associated with the selected customer (the currently selected customer has a black arrow next to it). The window that pops-up depends on which one is highlighted. If the field is Customer Name, then the Customer window will pop-up; if the field is Order#, then the Sales Order window will pop-up, etc. Click the Next button, when you have selected the customers to be included in the email broadcast. In the Message Source field, select an option from the drop-down menu to either compose a new or select from previous templates. There will only be multiple options in the drop-down list if the broadcast email process was done before and messages were saved. In the Subject field, you must enter a subject line for the message. 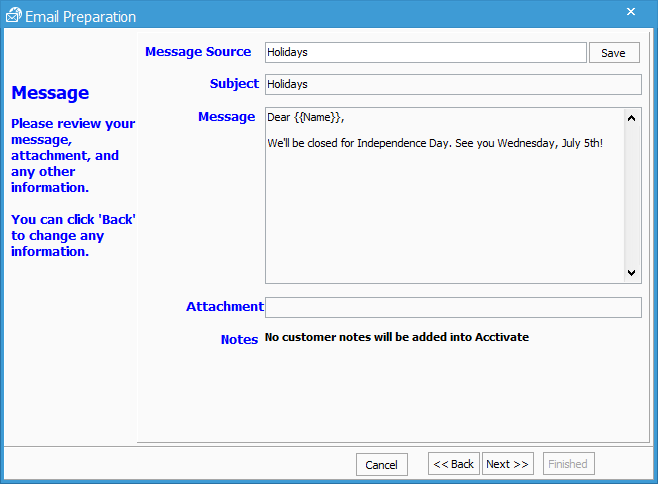 In the Message field textbox, type the body of your email message. If you want to include a file with your message, in the Attachment field type the file name of the attachment or browse your computer for it (using the button with the ellipses next to the field). In the Notes field, select an option from the drop-down menu, which includes “Don’t add notes” or to add specific notes from the options in the drop-down list. Selecting to add notes will record a note in a Notes tab of ACCTivate! for each customer that is sent an email. If you chose to add notes, select a radio button below to decide which fields show in the note. To include the subject of the email with the note that will be recorded in an ACCTivate! window, select the Subject radio button; select the Subject and Text radio button to include the subject and message text of the email with the note; or select the Custom button to type a custom note to be included. If Custom is chosen, a blank text box will appear for typing your note. 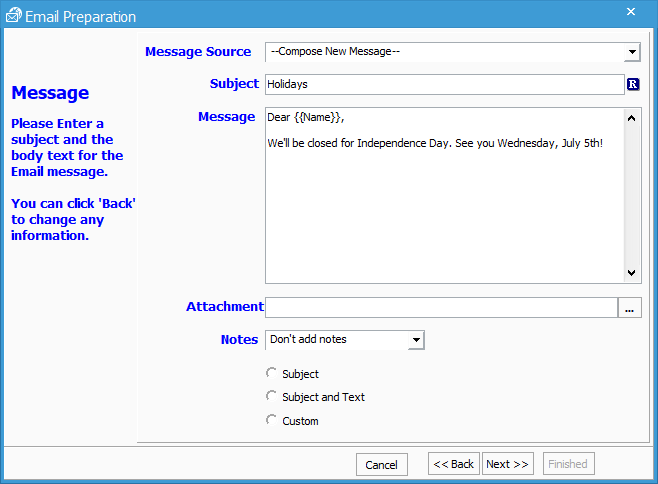 Click the Next button, when you have finished composing your email message and selecting the other components of the Message window. If you would like to save the message you just wrote, go back into the Message Source field and type a name to save it as and click the Save button next to that field. When you save a message, it will be displayed in the Message Source drop-down list with the name you just typed, so you can use this message again. The Send Emails window will open. 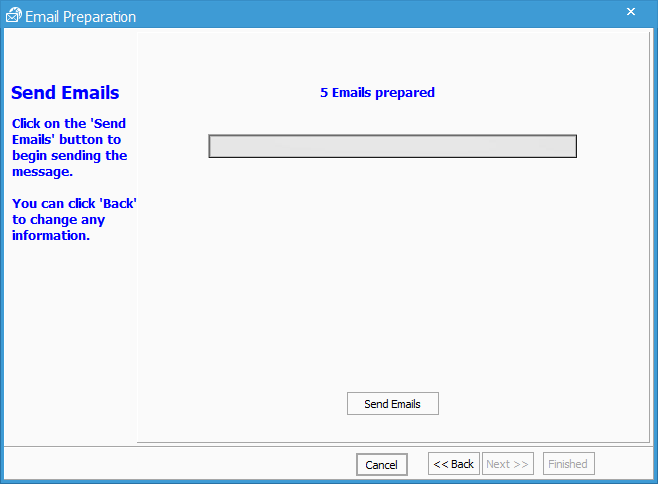 The number of emails prepared will be displayed near the top of the window. If you want to change information in any of the previous windows, click the Back button. If you have no changes to make, click the Send Emails button to begin sending the emails. The progress bar will be full and a message with how many emails were successfully sent will be displayed, when the emails have been sent. If some emails were not sent successfully another message will display of how many were rejected.